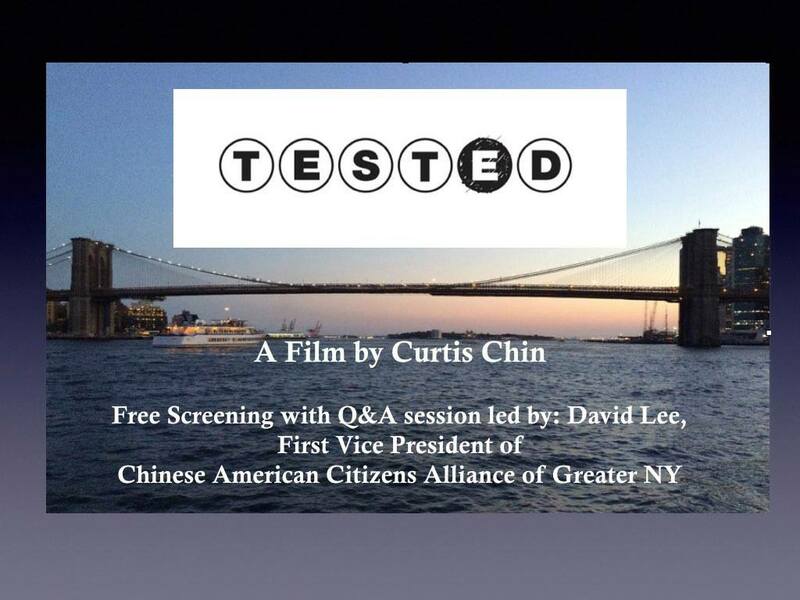 21 Pell Street is excited to present to you a free screening of "TESTED," a documentary by Curtis Chin on NYC's SHSAT and about the students that go on to take the test and what it means to their families. The SHSAT is now a hot button issue for all New York parents and students. It is currently an on-going battle of abolishing or keeping the admissions test between the Mayor and New Yorkers. It takes a deeper look into the issues that may be causing the disparities. Second Vice President, David Lee of the Chinese American Citizens Alliance of Greater New York will lead a Q&A. Community Activist, Karlin Chan and other guests are invited to speak and are to be determined. Please stay tuned for updates by subscribing to our e-newsletter to 21PellStreet@gmail.com with the word "Subscribe" as the subject line. From the TESTED website: "The gap in opportunities for different races in America remains extreme. Nowhere is this more evident than our nation’s top public schools. In New York City, where blacks and Hispanics make up 70% of the city’s school-aged population, they represent less than 5% at the city’s most elite public high schools. Meanwhile Asian Americans make up as much as 73%. This documentary follows a dozen racially and socio-economically diverse 8th graders as they fight for a seat at one of these schools. Their only way in: to ace a single standardized test. Tested includes the voices of such education experts as Pedro Noguera and Diane Ravitch as it explores such issues as access to a high-quality public education, affirmative action, and the model-minority myth." 21 Pell Street events are held in an historic church which requires all headwear to be removed unless for religious reasons. Due to the nature of the historic church, it is not wheelchair nor handicap accessible. There are no elevators. The screening takes place on the ground floor on church pews and the restrooms are located down one flight of stairs. All guests must refrain from eating and use of foul language while in the presence of the church. Donations to support the on-going all volunteer effort is greatly appreciated.